You just ordered your original My Pet Pail. Now what? I’m here to tell you my top tricks and tips for getting the most use out of your multi-use pet lunchbox! Get everyday use out of your My Pet Pail by using it as an innovative home feeder for your cat or dog! The My Pet Pail lid easily lifts away to reveal your dream pet feeder. The body of the Pet Pail is made from slip-resistant plastic and rubber edgings to reduce movement. This means your pet can eat without moving or spilling the bowls! The two smaller bowls on the top are removable for easy cleanup and the larger bowls below do the same. Both are dishwasher safe and 100% made from food grade materials. The space between the small bowls and the large bowls reveals extra storage for small items. Toys, treats, extra food, even ice packs for raw feeding fit perfectly. The lid of the Pet Pail is full of multi-use storage capabilities. The My Pet Pail comes standard with 2-20 oz. bottles to store additional food, water, treats, toys, etc. These bottles remove to allow standard prepackaged pet food containers to slide in securely. My Pet Pail comes standard with a built-in leash and collar for those just in case moments. 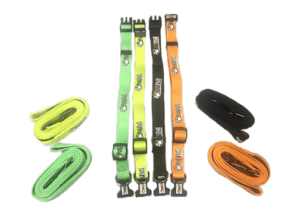 The leash functions as a cross body strap as the collar functions as a sturdy handle. Both come in handy when emergency situations arise! Out and about? 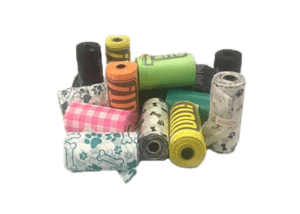 Our built-in doggy bag dispenser is the perfect natural calls solution! If you are unable to immediately throw away the doggy bag after use, there are multiple storage areas in the Pet Pail to conceal it. Now that you know how to use your My Pet Pail to the fullest potential, you are ready to seize the day with your pet! 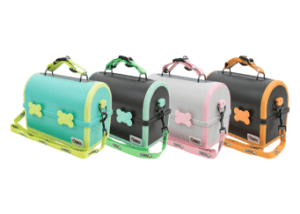 I hope that you learned new innovative ways to use your favorite pet lunch box. If you have additional questions, please reach out to our My Pet Pail family!